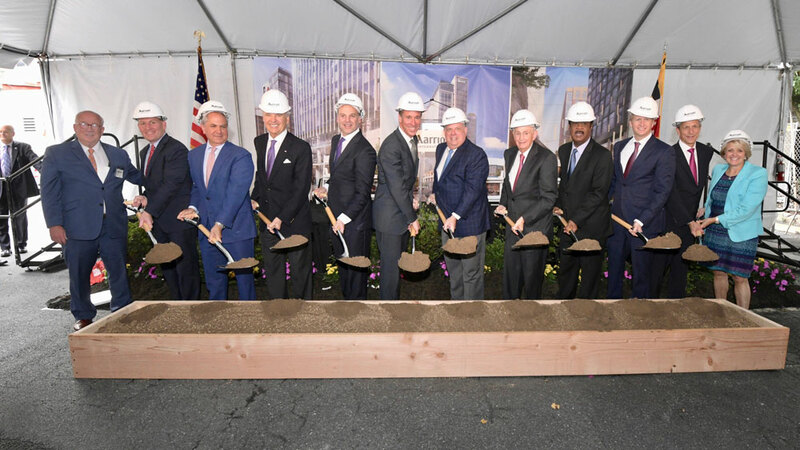 Bethesda, MD (June 21, 2018) — The Bernstein Companies and its joint venture partner Boston Properties marked a significant milestone today as they broke ground on the future Marriott International headquarters and Marriott Hotel in downtown Bethesda, Maryland. Marriott International President and Chief Executive Officer, Arne Sorenson, pushed Marriott’s move from its current suburban location to a walkable, transit-oriented environment. Sorenson said the headquarters office building will be a cutting-edge, sustainable, workplace offering state-of-the-art technology, modern amenities, and easy access to a range of transportation options, including the Bethesda Metro Station less than two blocks away. With more than 785,000 square feet of office space to support approximately 3,500 associates, the headquarters building is designed to LEED GOLD standards, allowing an abundance of natural light, while providing new opportunities for flexible, collaborative workspaces. The campus will also offer Marriott associates a childcare center, a fitness center, and a cafeteria. In addition to the headquarters building, the location will also be home to a new Marriott Hotel, a 244-key, full-service property with more than 8,000 square feet of meeting and ballroom space. The hotel will also offer guests and the public access to a coffee shop, a roof-top bar and lounge and a contemporary neighborhood restaurant serving breakfast, lunch and dinner with the option of outdoor dining on a pedestrian plaza. The Bernstein Companies, founded in 1933, is one of the oldest commercial real estate firms in Washington, DC. The privately-held company owns, manages, develops, and invests in a variety of commercial, residential, and hotel properties. The Bernstein Companies Hotel Division currently owns and operates hotels located in Washington, D.C., Maryland, Delaware and North Carolina. For more information, visit www.thebernsteincompanies.com. Boston Properties (BXP: NYSE) is a fully integrated real estate investment trust that develops, redevelops, acquires, manages, operates and owns a diverse portfolio of primarily Class A office space totaling 50.3 million square feet and consisting of 167 office properties (including eight properties under construction), six residential properties (including four properties under construction), five retail properties and one hotel. The Company is one of the largest owners and developers of Class A office properties in the United States, concentrated in five markets - Boston, Los Angeles, New York, San Francisco and Washington, DC. For more information, visit www.bostonproperties.com. Marriott International, Inc. (NASDAQ: MAR) is based in Bethesda, Maryland, USA, and encompasses a portfolio of more than 6,500 properties in 30 leading hotel brands spanning 127 countries and territories. Marriott operates and franchises hotels and licenses vacation ownership resorts all around the world. For more information, visit www.marriott.com.